The author of the excellent publication "The History of the Cajuns", my good friend Alex Loya, was deployed to Iraq and in his absence, I have been asked to act as official distributor of his book. The cost of this exhaustive 2nd Edition 678 pages book, is $39.95 $29.95 (USA funds) plus shipping-handling. Merely connect to my secure server to place your Online Order using Visa or Master Card and allow 2-4 weeks for shipment (depending on inventory). Yvon Cyr. NOTE: $10.00 surcharge for oversea shipment. 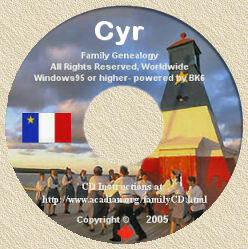 IMPORTANT: The Acadian-Cajun Family Trees was originally only compatible with Windows 95, 98, ME and NT. However, Progeny Software have now issued an upgrade for their Family Explorer Program and the CD can now be used with XP, Vista and Windows7. Contact Progeny Software to obtain required upgrade.